Thoughts of Australia, quite rightly, conjure up visions of its many iconic landmarks: Sydney Opera House, the Harbour Bridge, the Great Barrier Reef and Ayers Rock. 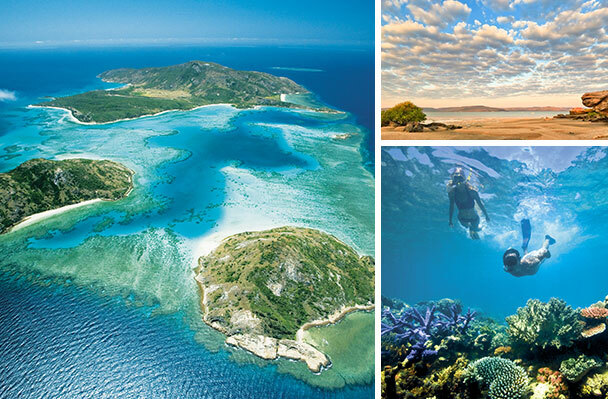 But there is another Australia – way up north, in the outback and off the beaten track – that few get to experience, and the best time to visit the Top End is during the British summer. When there is during the long summer holidays for once time to spare, a trip to Australia is a wonderful opportunity to create extraordinary family memories by combining a variety of places and experiences: remote bush camps, luxury homesteads, and nights spent camping out in a swag hosted by legendary local guides, ending up with one washing off the outback dust on a Great Barrier Reef Island. If you really want to push the boat out the best way to see this vast area is via a flying safari in your own plane or helicopter. 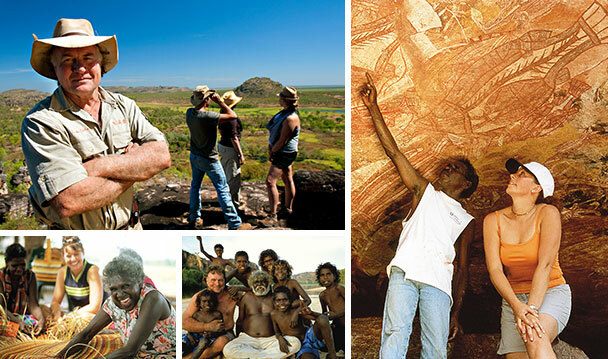 The staggering variations in geography, the abundance of exotic fauna and flora, equally eccentric guides and the Aboriginal culture that survives in Kakadu and Arnhem Land will have you creating your own ‘song lines’ or dreaming tracks. Bamurru Plains, home to huge populations of birdlife and wildlife, is Australia’s own version of the Okavango Delta. A 303 square kilometre buffalo station to the west of Kakadu National Park, it is where you will see thousands of magpie geese, egrets, raptors, buffalo, wallabies and huge salt water crocodiles. 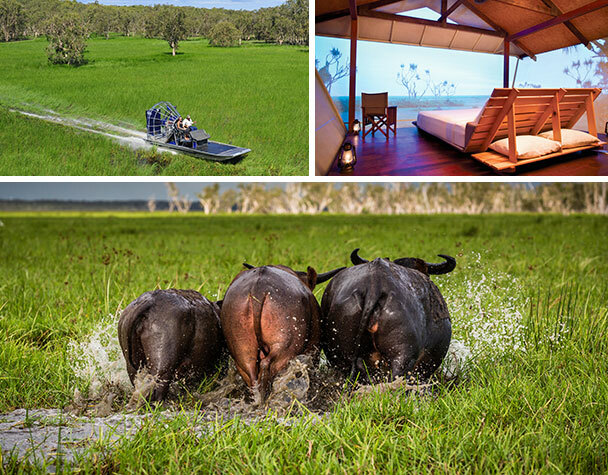 Explore this vast wilderness through safari drives, river boating and air boating – all really good fun and enhanced by the company of expert locals. Kimberley Coastal Camp, on the north eastern coast of Western Australia, is one of the least explored and wildest places on earth. Truly spectacular, the area has deserted beaches and swimming holes, scattered islands, amazing wildlife and birds, delicious fresh food and magnificent scenery that is best explored by boat or on a helicopter flight to view Mitchell Falls. The area is a fisherman’s paradise, and if you can catch it they can cook it! Bush walks take you to Aboriginal rock art galleries that include remarkable Bradshaw paintings and the younger but equally beautiful Wandjina art. Lizard Island, off the coast of Queensland, is one the most northerly islands on the Barrier Reef. It has twenty-four powdery-white beaches with giant clams and coral gardens just metres off shore. You are given your own little boat to explore, and secluded picnics on private beaches just add to the sense of adventure. If the Robinson Crusoe feeling deserts you, five-star cuisine and spa treatments will provide an indulgent alternative. Lizard is the epitome of stylish resort meets very relaxed Australian. These amazing wilderness areas are made even more special by your being in the company of some of the extraordinary characters that have made their life far away from the hectic world most of us inhabit. Sab Lord is one of these legends whom the word character doesn’t begin to describe. Renowned for his irreverent sense of humour, in true Aussie style he ends every sentence with ‘mate’! It is his guiding skills that set him apart. Sab has an encyclopaedic knowledge of this area. Whilst his guests may be allowed the luxury of a room, Sab will always, whatever the weather, rather sleep out in his swag. He is a great bush cook too, kangaroo fillets being one of his favourite dishes. In the 1950s, Sab’s father was a crocodile and buffalo hunter in what is now Kakadu National Park. With this backyard as his playground, it is little wonder Sab became fascinated by its nature, terrain, wildlife and the Aboriginal culture. He is lucky enough to enjoy a mutual respect with many of the local Aboriginal clans and this allows him, and those travelling with him, access to restricted areas where no one else can go. A special part of a safari with Sab is the opportunity to share in experiences that encourage an understanding between peoples and cultures in a truly authentic way. An expedition with Sab can include fishing, introductions to botany, conservation and wildlife and spending time with Aboriginal people whilst enjoying the incredible scenic beauty of one of the world’s great wilderness areas. Prices start from around £4,500 per person for a 2 week holiday.